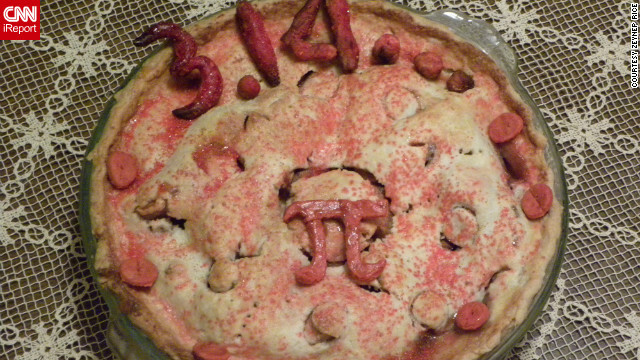 iReporter Zeynep Rice made this pie to celebrate Pi Day. Happy Pi Day! A favorite holiday among geeks, March 14 commemorates one of the most fundamental and strange numbers in mathematics. It's also Albert Einstein's birthday. This is a great excuse to bake pies, as many iReporters have (send us your pie-report!). But there are also lots of reasons to celebrate this number: Pi appears in the search for other planets, in the way that DNA folds, in science at the world's most powerful particle collider, and in many other fields of science. Here's a refresher: Pi is the ratio of circumference to diameter of a circle. No matter how big or small the circle is, if you calculate the distance around it, divided by the distance across it, you will get pi, which is approximately 3.14. That's why Pi Day is 3/14! But the digits of pi actually go on forever in a seemingly random fashion, making it a fun challenge for people who like to memorize and recite long strings of numbers (like this iReporter). By the way, the world record for memorization stands at 67,890 digits, according to the Pi World Ranking List. Here are 10,000 digits to get you started. To the uninitiated, such enthusiasm over a number may sound ridiculous. But when you think about how many different fields of science incorporate pi, it does seem kind of amazing. Be forewarned: We're going to have to use a bit of math to explain why. Yes, math formulas may seem scary, but trust us: It's worth the challenge. For Sara Seager, professor of planetary science at Massachusetts Institute of Technology, pi is part of everyday work in characterizing and searching for planets outside our solar system, called exoplanets. Here's her basic formula: The volume of a planet is about 4/3 pi times the radius3. You need this formula to find the density of a planet, which is mass divided by volume. This number that tells Seager and colleagues whether a planet is mostly gaseous like Jupiter, rocky like Earth, or something in between. 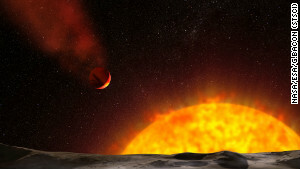 Pi is also involved in calculations regarding an exoplanet's atmosphere, since it can be described spherically, and spheres always involve pi. "Coincidentally, pi is useful to estimate the number of seconds in a year (on Earth): There are approximately pi times 10 million seconds in a year," Seager says. And a tiny space telescope that Seager works on called the ExoplanetSat, which is a collaboration between MIT and Draper Laboratory, also incorporates pi in optics equations related to the telescope's mirror. Pi helps describe the shape of the universe, says David Spergel, chairman of Princeton University's astrophysical sciences department. Spergel studies cosmic microwave background radiation, which is basically radiation that's still hanging around from the early universe - it's the afterglow of the Big Bang. 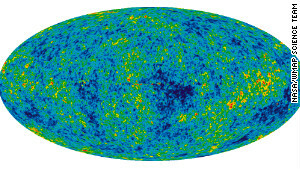 Using a spacecraft called WMAP (Wilkinson Microwave Anisotropy Probe), Spergel and colleagues have been able to get an idea of what the early universe looked like - a "baby picture," as it was called when WMAP's 2003 results were released. 4pi is the ratio of the surface area of a sphere to the square of its radius, in geometrically flat space. "Using our measurements of the microwave background, we measure this ratio by determining the angular size of hot and cold spots in the microwave sky. Our measurements show that the large-scale geometry of the universe is accurately described by the Euclidean geometry that we all learned in high school," Spergel says. "This measurement implies that the total energy of the universe is very close to zero." Why? The positive energy from the universe's expansion (it's been expanding since the Big Bang) is balanced by the negative energy of matter being attracted to itself, via gravity. Pi comes up a lot in what physicists do at the Large Hadron Collider, the $10 billion machine at the European Organization for Nuclear Research (CERN) in Switzerland that smashes protons into protons at unprecedented energies. Scientists are looking for as-yet-undiscovered particles such as the Higgs boson, which popular culture refers to as "the God particle." In particle physics, if we can measure particle properties, like masses, very very precisely, we can sometimes find tell-tale evidence of undiscovered new particles. That’s because particles can transform themselves into other particles, and then come back together to make the original particle again. This is called a loop. When you calculate the contribution of this process to the particle's mass, a factor of something like 1/(16pi2) comes out, along with other factors that depend on the properties of the particles in the loops. 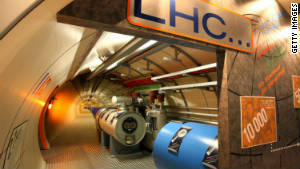 Interestingly, prior to the LHC, some particles could only appear in these loops, and nowhere else, and should come in pairs in order for a special property that they have to be conserved. A very important example of a theory of particles with this kind of behavior is what scientists call supersymmetry, and it helps explain a lot of the holes in our current best understanding of the universe, known as the Standard Model. Scientists are hoping to see these kinds of particles directly which requires very high-energy particle accelerators like the LHC to make them. They will also continue to try to detect their effects on Standard-Model particles in these loops, which are extremely short-lived and this requires a lot of patience because measurements must be extremely precise. So, supersymmetry will probably still be out there for us to discover, even though there is no evidence of it in detailed measurements of particle parameters at the LEP and Tevatron accelerators in the past (or at the LHC either, so far, but there's still a lot of room to look for them). R_ij – (1/2)R g_ij = 8pi*G T_ij. Wow, what is that? Sean Carroll at California Institute of Technology acknowledges that this is a weird-looking equation, but the important part is that G is Newton's constant of gravitation. "Long story short: in Newton's equation for gravity, the constant is just G; in Einstein's equation, it's 8pi*G," he says. Let's say you know how much mass the Earth has, and you want to figure out what the strength of gravity is at some distance away. Newton's equation tells you what that force is - it's proportional to one divided by the distance squared (the famous "inverse square law"). But let's say you want to do the opposite - you know what the force is, but you want to figure out how much mass is causing it. You could draw a sphere that completely surrounds the object, and add up the gravitational force at each point on the sphere, to make sure you are correctly capturing what's going on inside. So the answer to one question is related to the answer to the other, by adding up things all over a sphere. And the area of a sphere of radius R is 4pi R2. Voila - pi comes into the expression, because pi relates distances (straight lines) to spheres. Pi plays an important role in the way the genome is folded, says Leonid Mirny, associate professor at MIT. "If you take all DNA of the human genome contained in a single cell and stretch it, the DNA would be a 2-meter-long fiber," he says. How are these two meters of DNA packed inside a cell nucleus, which is only 5 micrometers (that's 5 millionths of a meter) in diameter? Think about thread around a spool. 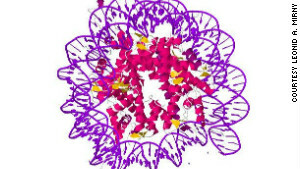 At the cellular level, there's a core made of special proteins called histones, and they're like the spool. DNA wraps twice around it and then continues to the next spool. Each one of these spools is called a nucleosome, and tens of millions of them pack our DNA, making it look like a string of beads. How much shorter is this string than the DNA itself? The answer is about 1.5pi (or about 5) times! Choose two random numbers between 1 and 1,000. Then, he could compute whether they have any factors other than 1 in common. "It turns out that the probability of having no common factor is a a little over 60%," he says. "And you can change 1,000 to 10,000, and then to 100,000, etc etc, and amazingly the probability seems to be converging to a fixed value, about 60.79%. More amazingly still, this value is 6/pi2!" 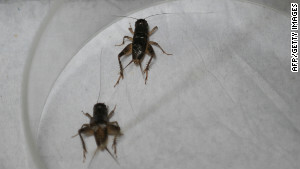 Crickets use sound to locate mates, and their reaction to fellow crickets' calls are of interest to Gerald Pollack - a biologist at McGill University in Montreal, Quebec. In one of his experiments, crickets walk on a spherical treadmill while a loudspeaker broadcasts a cricket song. How accurately do they walk toward the sound? "We measure the discrepancy between the direction of the loudspeaker and the direction in which the cricket walks, both of which are measured as angles ranging between zero and 2pi radians," he says. James Clerk Maxwell Maxwell published famous equations of electromagnetism in the 1860s. They are fundamental to modern electronics and communications. These equations include an important physical quantity called "the permeability of free space," which has a value of 4pi x 10-7 H/m that's units per Henry per meter, where a Henry is a unit used in electronics. "So we are all using pi every day when we think about magnetic or electric fields, or electromagnetic radiation (light, radio etc)," says Caroline Ross, associate head of the Department of Materials Science and Engineering at MIT. 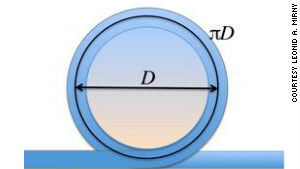 Pi is involved in calculating the surface area and volume of round three-dimensional objects. So, if you're planning to build something involving spheres or arches or some kind of circular geometry, you're going to need pi! Chandrajit Bajaj at the University of Texas, Austin, is researching molecular recognition models for drug design and discovery. She uses simulations of particles in which atoms are often represented as spheres. The formulas for molecular surface area and volume involve pi, and often appear in Bajaj's calculations. So, there are more than 3.14 reasons that pi is special. Now go eat some pie! "Be forewarned: We're going to have to use a bit of math...". Ugh! PLEASE don't write like that! It's pathetic, especially since you don't proceed to use much math at all! Would you even consider writing "Be forewarned: We're going to have to use the word "the" multiple times in this article"? In an article about gardening, would you apologize for using botanical jargon? Most likely not. You might as well apologize for opening the door to a fantastic art gallery. Math isn't scary, but our tax dollars spent on crickets walking on hampster balls kinda is. Was your Pi baked by a crusty mathmagician? Pi is peachy, there are lots of pigs in Georgia= +P, which gives us PiG. Math is then a route to bacon. Porkpie is not a food nor is it a calculation. People wearing porkpie hats know a lot about pigs. Not so much about math. 4 dead in ohio<===((( See? MATH! preoccupy an occupier today, or tomorrow if you were preoccupied. It's kind of sad that they have to include a patronizing warning that this article contains math. i find it amazing that someone actually memorized pi out to 67k digits. i have trouble remembering phone numbers. in at least the first 10,000 digits. actually, we have no way of knowing how rare any specific string of digits is in a number that is, as far as we know, infinitely long. Why does an article that intelligently explains the relevance of pi, have to start with a disclaimer: "Be forewarned: We're going to have to use a bit of math to explain why. Yes, math formulas may seem scary, but trust us: It's worth the challenge."? Why presume that most Americans reading this article would be troubled by its mathemcatical content? That would be for people like me! It's amazing what I have forgotten about pi being out of school for so long! This is a great refresher...now I wish I could understand the math in Walter Isaacson bio on Einstein...that guy was not from this planet! Pi has definitely been important in my life. It is quite easily my favorite number, though two comes close. Though I must point out, eating pie is somewhat irrelevant on Pi Day. Do consider that pie=pi*e, which is 8.53973... Too bad there isn't a fifty-third of August! how express and admirable, In action how like an Angel! world, the paragon of animals. gotta love the dichotomy between this post and the one directly below it. We're not the paragon of animals. I'd like to see you outrun a cheetah. That's why we built cars, and airplanes. And spacecraft. Voyager is traveling at @ 32,800 MPH. Once in awhile, it is a good thing to appreciate that we, as a species, are capable of great and noble feats. That's the most disgusting looking pie I have ever seen. The adornments do look a bit like uncooked meat. Pink was probably not the best choice of coloring. Write 3.14 on a piece of paper and then, either hold it up to a mirror, or hold the piece of paper up to a light and look through the reverse side for a surprise! A ha! Thus proving that Pi = Pie (sort of), thus proving that Pi is, in fact, edible in an alternate universe! Why do Americans write the date wrong? it's rather obvious it should be from smallest to biggest so 14/03/12!! using month then day then year is silly!! Hmmm... seems like "120314" would be preferable for sorting purposes. svscnn wins this debate! Putting the day first is just plain silly! Hey, if it's good enough for Burma and Liberia it's good enough for the US of A! Seriously, those are the only three nations that haven't adopted SI measurements. Joe, I counter by suggesting that you enroll in a remedial English class, so that the next time you're tempted to participate in a discussion your post might actually make sense. It's like that near Toronto too. We use some weird hybrid metric/imperial system, depending on the measurement in question. I couldn't tell you my height in centimeters or my weight in kilograms, but I do temperature in Celsius and distance in kilometers and couldn't begin to tell you the imperial equivalent. Personally I prefer month first, it's more important than the day. The day can belong to any month vs there is only one number representing the month so it's faster to look at it. If we did that today would be othewrwise irrelevant and you would have had to find something else do. Ok Nick, I'll bite. Your system does indeed make sense from a numerical point of view. It progresses from day to month to year. Perfectly logical. But in colloquial English we say "March 14" not "14 March". So our date is written to match our way of speaking. Also logical. Every time I read these lightyears things, I think it's going to be good this time....but it just makes me feel 300x dumber. I feel like I'm reading a report from a know it all 1st grader. "Math is really scary to you, but can be fun. 4/3 pi*r^3 is a complicated formula and it uses math – I know you have no idea what that means, but believe me I'm smart and I know it's really cool." And really, on the crickets? They could have just as easily put anything else. Of course things are sometimes at angles to other things, and those angles can be expressed in terms of radians and they'll be between 0 and 2pi because that's how radians work! aaaaghhh! 100% agree. These articles are especially juvenile when compared with BBC's reporting. They actually have a "Science" section. You get the same kind of experience when you compare a show like BBC's Wonders of the Universe to any show on Discovery. On BBC they may ask, "What is the evidence for life on other planets?" While on discovery they ask, "Can we survive an alien invasion?" It's the Yanks! On old morse code! They are planning a countattack! They claim they can bring down the shields! It's about time... What time do they want to begin? Based on the comments I see here, the folks who discovered pi thousands of years ago (and only very roughly determined its correct value) are far more intelligent than the average internet surfer. Public school much? Perhaps if you think I'm referring to YOU, you should politely excuse yourself from any further intellectual activities, go back to school, and do something you've never done before - pay attention. Regardless of who it is you're addressing, Chris, your condescending posts don't make you appear any smarter. They do, however, make it obvious that you'd probably be a lot more comfortable if you'd only remove that stick. Son, try to get out more and play. Really. If you think this article is underwhelming, try explaining to the average dolt how pi is related to the natural logarithmic base, e. I have a degree in math, and I barely understand that one myself. But it is beautiful, and anyone who can't comprehend it can be somewhat forgiven for falling for religious dogma. The base of the natural log "e" (2.7182818284...) raised to the power of ( "i" (imaginary number derived from the square root of -1) times "Pi" (3.1415926535...)) plus one equals zero. Hello Everybody! I was just about to type the same thing! Wow, full of yourself much? I am highly religious and also a mathematician. I understand what you are talking about. I believe God to be the master mathematician as well. Just because one is knowledgeable in science or math doesn't make them not religious. On the contrary science and math help back up my belief in God. See 1 King 7:26 (about the shape). This could mean that 1 King 7:23 was talking of 30 cubits at a lower diameter. That's just another failure to try to explain the errors and contradictions in the Bible. You better see what the shape was. You sound dogmatic. It says :... and it took a line of 30 cubits to circle all around it." Now 1 Kings 7:26 gives us additional information that could explain the lenght of the line. If you want to ignore that FACT it's up to you. Science is based on facts not prejudice. Take all the facts into consideration. Science is based on FACTS. A circle with a diameter of 10 CANNOT have a circ-umference of 30. Maybe you should review the definitions of circle, diameter, and circ-umference. It's just rounded isn't it? No matter what number you use, since Pi is a transcendental number, it will be rounded to some degree. They were talking of 5, 10, and 30. Seems not very exact to me; "5, 10, and 30 cubits, more or less." Could you please give me the exact length of the line? Is it 31.4? Why? Because it's chapter 3, verse 14? Oh, how clever! Chris, do yourself a favor, think before writing. No thanks. I prefer reality over silly mythology. On an unrelated note, there are currently only 68 (well, now make that 69) comments on this article. Meanwhile, there's probably another article on some Kardashian (sp?) somewhere with over 3k comments and counting. You had me at "tragic beaver accident"
Nothing like a big 'ol endless slice a Pi to get the philosophy thoughts a churnin'. Yep, ya gotta love Pi. So like we could be totally cool and stop posting here after 314 entries. not. I think that the value of pi is an indescrepency, a flaw, that the universe can't account for, and that's why it is also based with the number 3, in relation to the pyth. theorum if triangles. The point is.. pie goes on forever because it's a flaw that even the creator of the universe can't account for. So easy as pi, even a caveman . . .
What the @#$%^ is an "indescrepency", Einstein? So you think Pi is a problem? Look up the fraction 1/137 on google. I like pie as much as the next guy, but this whole article and comments section is really confusing. For starters, why is everyone mis-spelling "pie"? Is this some kind of joke that I'm just not getting? Are you a Republican and a fan of George W. Bush? Ahh... yeah... it was a joke. I would hope that someone flouting the name "Observer" might be observant enough to get that. My response was a joke too that you apparently didn't get. I was wondering how politics was going to get into this. Shut your pi hole. Priceless. If only there was a "like" button. Oh... well.. NOW it makes sense. I wouldn't say that. I think your comment on the Kardashians (however they spell it; I would have checked that myself if it had been worth the effort) was right on! Yeah, I wasn't about to spend any extra seconds of my life spell-checking that either, Observer. Thank you for the apology, but didn't you get the memo? Bloggers are NEVER supposed to apologize or admit they are wrong. Instead, if questions are raised to show they are wrong, they are to resort to any of the 3 approved responses: (1) ignor the question, (2) attack their opponents with juvenile insults or (3) pretend they didn't see the response and leave. Hmmm.... I'll have to keep that in mind for the future. "measured as angles ranging between zero and 2pi radians"
Crickets? Really? They are measuring an angle. They happen to use radians (which is based on pi). Pi is not related to crickets. That's like bringing up CNN.com on a discussion about the color blue, because blue is sometimes used on CNN.com. Sure, that is true, but it is completely irrelevant. Quite right! I just posted the same thing at 2:21 also, a few comments below. "We measure the discrepancy between the direction of the loudspeaker and the direction in which the cricket walks, both of which are measured as angles ranging between zero and 2pi radians,"
Isn't 2pi rad = 360deg? so 2pi rad = 0deg? so basically he meant angles ranging from 0 to 360deg, which is a full circle. Where am I wrong? I don't see that you're wrong anywhere. He's saying that they measure the angle, and indeed angles range from 0 to 2pi radians (or 0 to 360 degrees). Nothing wrong there either, but the whole cricket example is rather specious – it's basically saying "in this experiment we measure angles, and angles are involved with pi". well, if we are talking about how crickets walk respect to a speaker and their walk direction is basically any direction there is really no relationship with pi. I find it fascinating that our scientists can find universal truths by using numbers, which were thought up by man thousands of years ago. I believe in I.D.therefor pi doesn't exsist! A surprisingly close approximation is the fourth root of 2143/22. Pi also happens to be the approximate value of the square root of ten. I wouldn't want any engineers using an approximation that rough. Typically, getting 85-90% accuracy is enough for everyday applications. So what? The entire modern, tempered musical pitch structure is based on an exponential function that approximates the fractions of Pythagorean harmonics. The connection between 10^1/2 and pi is practically meaningless compared to that. A little knowledge is a dangerous thing, folks. Well, I hope it is clear to all of you from this article that there was some really "intelligent designing" going on when Pi was formulated. If not how can one explain PIEty or the offensive hipPIEs that dog our every day lives. in protests around the country Frankly, I find all of the Pi references pretty crepPIE and intend to sign off from this blog and make whopPIE with my yupPIE wife. I would sign this with my sharPIE if I could – I too am thankful for smart people – Hail to science!!!!!!!!!!!!!!! Isn't Pi day in three years? I'm sure there will be an even bigger celebration then! Thanks for reading. Actually, since the value of Pi is 3.141592653 . . ., rounding to the nearest 1/10000, gives a value of 3.1416. Let's not celebrate too early. Looks at the 10,000-digit value of Pi provided by CNN. Tries to read the numbers from start to finish. Stops after the first 10 digits. Looks at CNN and flips the angry bird. Happy Pi Day! I am making a pi pie today to celebrate. "Yes, math formulas may seem scary, but trust us: It's worth the challenge." The challenge? The most complicated formula in here aside from Einstein's is 6/pi^2. If you can't understand that one, you shouldn't have been allowed to graduate middle school. I have Pi memorized to 7 decimal places. Not as impressive as some. However, I can recite the alphabet backwards and sing the McDonalds menu song. So there! I can say The Lords Prayer backwards as I levitate and a curse of frogs melt the stones of the castle. I can desecrate a virgin at the same time, and make a gravy and bologna samich, while looking for Whitney's crack pipe and tying a mayfly and casting just beyond that odd shaped stone. As I'm doing my Elvis impersonation and dancing with Dennis Hopper to the sweet, sweet strains of " In Dreams" about Roy Orbison's Candy Colored Clown, as sang by Dean Stockwell. I usually have to stop here and call Wayne Newton to see what's next on the old agenda, pudenda, whatevah. NO Liberace. Pi Day is meant to be eaten. Check out this breakfast pie. Are those chocolate frosted mini wheats on top of the pie? As that great unsung genius Mrs. Einstein used to say, "Pi equals fat behind." I memorized Pi to 100 digits when I was 12. At 38, I can't say that it's been especially useful for math or engineering, but it has amazed and amused friends and family on many occasions. My kids frequently ask me to recite pi. I can say it really fast; it takes just a few seconds. Well, the thing about that is, once you get past five or six digits the odds are that no one else in the room will know if you've made a mistake so you can just make it up as you go. What about pie? Ever used that? The whole concept of irrational numbers is yet another one of Satan's deceptions. Like dinosaur bones, extended warranties, and soy milk. It's so difficult to find anything to really believe in anymore. Dude: It is even MORE diabolical than that. Pi is–horrors!–Transcendental! Satan just has to bring on those unnecessary things...like when you find a jolly rancher wrapped in a blue rasberry wrapper when its watermelon and your roomate wants to post it on facebook...uh idiots. Let's get started. Did god create Pi and the Fibonacci sequence, or was it man? meh. such things will still exist long after our sorry species is extinct, and with us, our gods. I have a better question. Can your god create a universe in which the value of pi is different? The answer is no. Doesn't seem that all powerful now, does he? Think about it. Physical constants (the gravitational constant, speed of light, etc) can be different in other universes. But the value of pi must always be the same. At least making this a religious vs. science discussion makes it more interesting. The Bible gives an example where pi is equal to 3.0. Yet another indication that it was written by a being somewhat lacking in the omniscience department. You realize when you round the first 4 digits of pi, 3.14, it makes 3.0. Here is a little deeper question... Q. If man became capable of understanding all science and by doing so was able to control it what would that make that man? A. A god. Science and God... God and Science... You can't have one without the other. Without God science is flawed and without science God would be flawed. The only place they don't coexist is in closed minds that feel they have to be smart enough to figure it out by logic. Science isn't discovered only by logic. A lot of times it's by luck or... divine inspiration. Got to give credit where credit is due. I personally am thankful for the smart people. Darn, I was really hoping you would use "your." I've been searching for irony all day. Modest! Meanwhile what about 1/137?